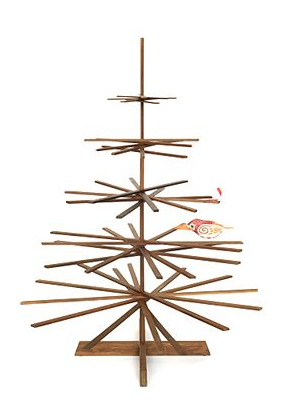 This wooden tree, made sustainably from scrap hardwood in the U.S., seems fairly close to this older tradition. This object has such nice geometry you could actually leave it out all year minus the Christmas decorations. It is called the PossibiliTree. At Christmas, if you wanted that Christmas tree smell, it would be simple to get a few boughs and tie them to these branches. 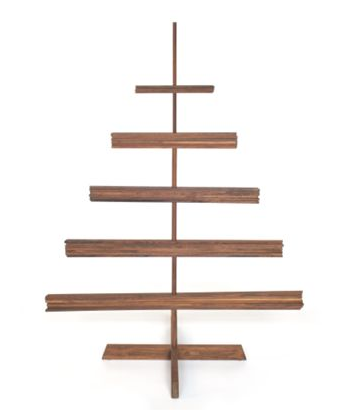 I usually have a policy of not encouraging people to buy things on this blog, because I don’t like consumerism and I think people should always go DIY, but this is one of those objects that’s so well made, so well-conceived, and so environmentally friendly that I think people interested in Christmas should consider one. It has a midcentury modern feel, and I seem to remember that one of the Eames playing cards had an image of an object something like this. Maybe that’s partly why I like it so much. There are different sizes; this is the smaller one which can stand on a table as well as sit on the floor. The largest one is suspended from a hook in the ceiling—which is very easy to do. There are different colours too—walnut, birch and cherry. The tree arrives in a mailing tube and you assemble it yourself, which is apparently not difficult. If you don’t like chopping down a tree every Christmas, this seems like a great idea, so much better than a synthetic tree. It’s made on this continent, too, out of local hardwood trees. Order here: Possibilitree. PS the price of the 6′ suspended tree has come down substantially (though is still not cheap, especially with a low Canadian dollar). This entry was posted on Tuesday, October 13th, 2009 at 10:10 am	and is filed under design, furniture, green, interiors, landscaping. You can follow any responses to this entry through the RSS 2.0 feed. You can leave a response, or trackback from your own site.